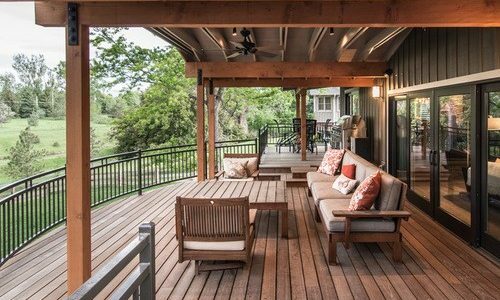 A thoughtful deck design can beautifully bridge the gap between the inside of your home and out, providing an inviting, comfortable space from which to enjoy your backyard. And, far from being a basic rectangle at the back of the house, a deck can be customized to fit your house and lifestyle to a T.
Who says deck design has to be straight and square? 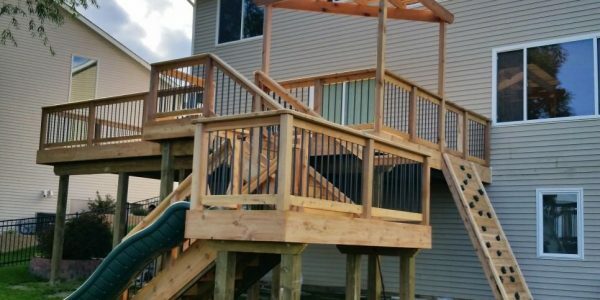 Curved decks are an eye-catching visual treat! 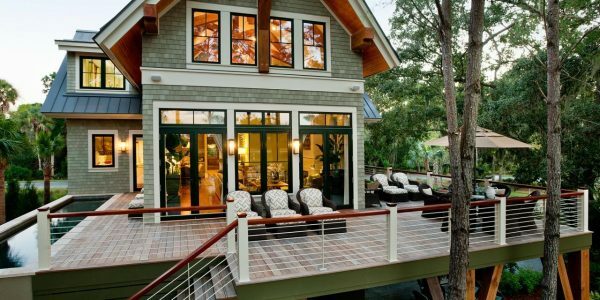 Balance the diverse shapes and sharp angles of a Craftsman Style or contemporary home with a softly curving deck. The contrast makes for a beautiful end-result, and a very welcoming space. Add steps down to the deck area and a concrete retaining wall to create a cozy feel, as well as a bit of a windbreak. 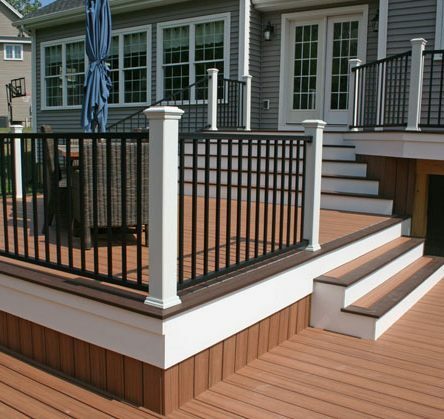 Tip: Try mixed materials, such as metal railings and gates combined with wood or composite flooring. If the gardens and landscaping are the star of the show on your property, why not emphasize them with your deck? 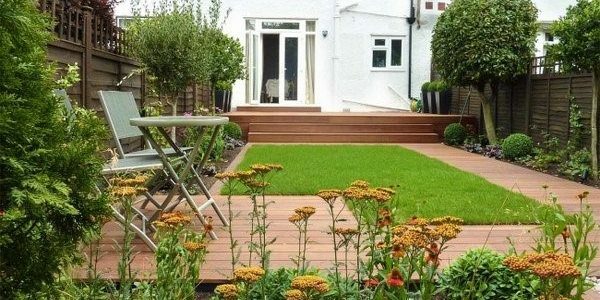 Encourage garden exploration by placing a series of interconnected decks throughout the landscape. These decks can act as a guide, winding through the landscape with a variety of seating spots along the way. Tip: Using a combination of narrow pathway decks and wider platforms will draw visitors through the space. Love eating outside? Create a dining room deck that you can use all year round! Plan your deck to fit a full-sized dining table and site it for maximum dining enjoyment that’s not too far from the house. To maximize your outdoor food prep and meal creation, install an outdoor cooking station, sink and coolers. Hang string lights or lanterns for festive occasions. The possibilities are endless! 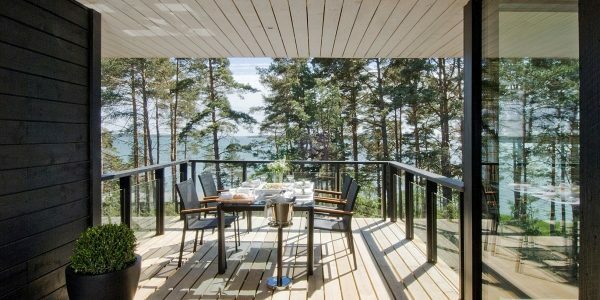 Tip: Think of your deck as a dining room without walls with the view as a backdrop. If you’re thinking of ways to expand the living space of a smaller home, consider opening a corner of walls into a spacious deck. A corner deck can complement the sharp angles of modern architecture, and give the feel of much larger living space within the home. 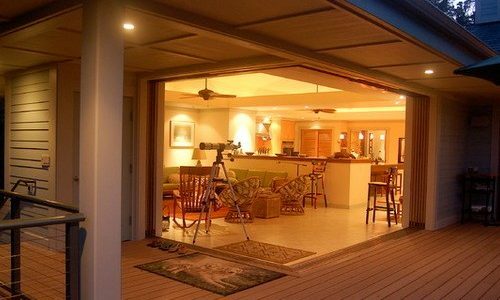 And, if you can add sliding glass doors leading onto the deck, the result is elegant and stunning. Tip: Create a seamless transition from inside the house to the outside deck by matching the color scheme and materials. If your home is eclectic and full of creative touches, you should also allow yourself to think outside the box as you plan your deck. Try using disparate elements and whimsical pairings. Combining wood decking with concrete elements works especially well with contemporary, modern and urban homes. In addition to walls and stairs, consider working in a concrete planter or built-in bench seating. Tip: Mature tree in the way of your deck plan? Frame the trunk with your deck flooring for a fun and beautiful result! Looking for more tips, ideas and guidelines for your deck design? Check out our helpful Deck Design Guide!